Testosterona is a synthetic veterinary version of testosterone that has a very strong androgenic effect and a good anabolic effect. It is a long acting (usually stays in the system from one to two weeks) injectable testosterone that is desired because of its huge mass and strength building characteristics, which usually appear in a short period of time. The big draw back of it, along with all testosterones, is that it is common to have feminization side effects due to its high estrogen conversion rate. It also has been known to be moderately toxic to the liver. Though it is not chemically addictive, it seems to be because athletes can rarely keep their gains after discontinuing a cycle, resulting in addictive behavior. 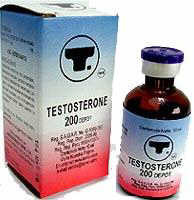 Dosages of Testosterona 200, widely vary from 500 mg up to 3000mg per day. The most sensible dosage is between 250 to 1000 mg a week, usually used all at once. Because Testosterona 200 is an androgen, it had been known to stack very well with Anapolon, Metandiabol or Reforvit B, Decadurabolin or Norandren 50, and Parabolan . It has been said that a good stack is Anapolon 100mg/day, Deca-Durabolin 200mg/week, and Testosterona 200 up to 500mg/week. And often times Metandiabol replaced Anapolon at 40 mg/day after about six weeks. 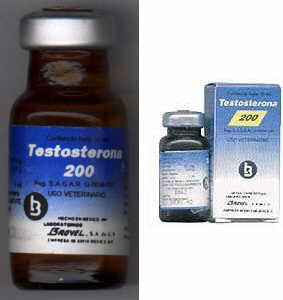 Testosterona 200 is typically sold for about $17-$20 USD on the black market for a 200mg/cc x 10ml bottle. 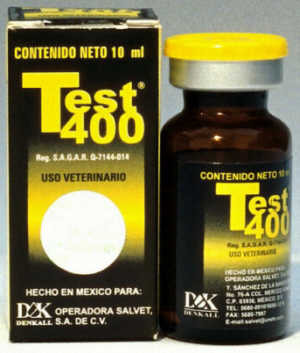 Testosterona 200 is usually avoided by beginning steroid users due to its extreme nature. Because Testosterona 200 is a synthetic testosterone, it is wise to use a testosterone stimulating compound such as Gonadotropyl, Gonakor, Profasia, Nolvadex, Tribulis (Tribestan) or even HGH at the end of a cycle. This is important to bring natural testosterone levels out of suppression. This will hep reduce side effects and help the retention of acquired gains. Some side effects associated with Testosterona 200 and testosterones in general are excessive sexual stimulation, high blood pressure, acne (more on body than on the face), feminization in the form of gynecomastia and testicular atrophy, hair loss, and deepening of the voice. Testosterona 200 is very harsh on females and is not recommended. Females are subject to a great deal of virilization which results in acne, increased facial and body hair, thinning and balding of the hair, menstrual irregularities, increased clitoral size, and increased libido; most of which are irreversible side effects. Order Testosterona 200 and other steroids by mail order!